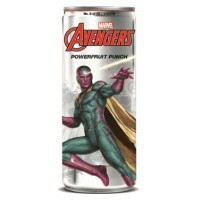 Become the ultimate Marvel Fan when you order a set of Avenger Powerfruit Punch Soda cans. This one features artwork that celebrates Vision, the avenger inspired by one of Marvel’s oldest comic book characters! 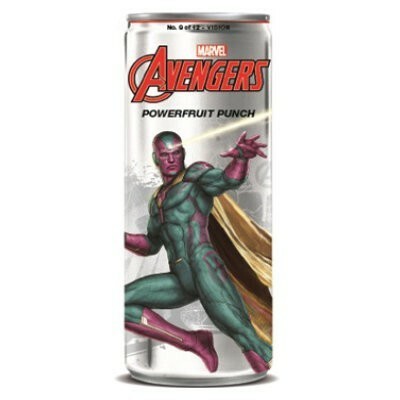 The iconic can illustration and refreshing fruit punch flavor soda is the perfect way to celebrate the Marvel fandom! Water, concentrated juices (black currant (6,5%), pomegranate (3,5%), cranberry (1,8%), chokecherry (0,1%), blackberry (0,1%)), acidity regulators E500ii-E330, flavors, sweeteners E952-E955, concentrated carrot color, acai extract, vitamins B3-B5-B6-B1-B12.